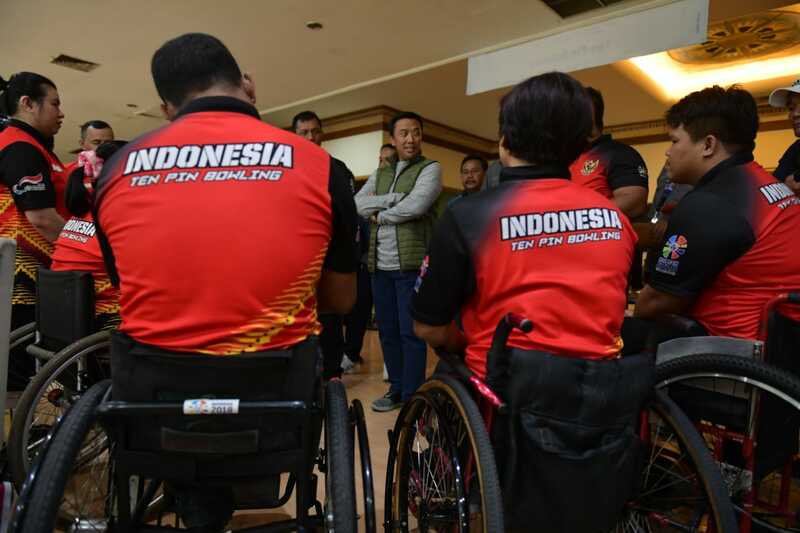 Given maximum preparation at the national training camps, Minister of Youth and Sports Imam Nahrawi expressed optimism that the Indonesian Team at the 2018 Asian Para Games can meet the target of finishing in the big 7 in the medal tally. One of the sport branches expected to contribute gold medal, he added, is bowling. The statement was made by the Minister during his visit to bowling national training camp in Bengawan Sport Center Solo, Central Java, Thursday (9/13). Imam also ensured that the preparation at the national training camp is already at its maximum capacity and only needs few adjustments at competition venues in Jakarta. “From bowling, we hope to win one gold medal that can help us reach the goal of finishing in 7th place,” he said. On that occasion, the Minister said he was impressed with the potential of female athlete Elsa Maris who can win a gold medalist in bowling. According to the Minister, Elsa Maris is showing a good progress in her training. “I tried training with Elsa. She really deserves to be a gold medalist. All she needs is our support in terms of psychical and mental preparation. And also I urge the National Paralympic Committee (NPC) to monitor the athlete’s condition, nutrition, psychological condition, so they can achieve maximum results and tackle non-technical difficulties,” the Minister said, adding that the athlete tryout results are important and cannot be ignored. The Minister added that the athletes would not find difficulties adapting with the venues. “Related to the venue in Jakarta, the 10 athletes (3 females, 7 males) are expected to quickly adapt to the venues although they are old venues,” he said. In the meantime, APG Bowing Coach Waluyo said: “Tryout results are our benchmark. From tryouts, we can make sure that athletes have competed with other athletes that may not participate at the Asian Para Games (APG).” He also acknowledged that bowling has a big change to contribute to gold medals. “It is true the potential of gold medal is 99 percent from Elsa based on her tryout result in Malaysia. Her rivals are four people from three nations (South Korea, Malaysia, and Singapore),” Waluyo said. For the record, Indonesia finished at 14th place at the 2010 APG in Guangzhou with 1 gold medal, 5 silver medals, and 5 bronze medals, while at the 2014 2nd APG in Incheon, the country finished in 9th place, earning 9 gold medals, 11 silver medals, and 18 bronze medals.